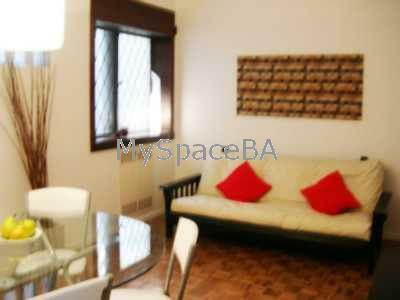 Nice and bright one bedroom apartment located in Downtown , close to Puerto Madero, Plaza San Martin and Retiro Station. The apartment has a living with sofa bed , a dinning area with table and chairs . Aircon . Central Heating . Cable TV . TV . Internet High Speed . Mobile phone with pre-paid card . The bedroom has a queen size bed or two singles bed. The kitchen is equipped and there is a full bathroom with bath tub and shower. Hardwood floor . The apartment is located at the back of the building that ensure peace and tranquility . Internet . Ample closet . Aircon . Heating . Hair dryer . Kitchen with gas range , oven , microwave , dishes , coffe - maker. Service cleaning once per week . Good building . Doorman 24hs . Elevators . City centre , Puerto Madero , Retiro Station , Port , Metro station , bus stop , church , college , gym , solarium , restaurants, bars , nightlife area, shopping area , square , cinemas , cultural centre , historical place , laundry , parking space, etc.